He checks the image looking back at him about a dozen times a day. Life for a Border Collie puppy is a series of new adventures, new experiences, different tastes, smells and sounds. But the one adventure, an inevitable rite of passage, is always a hilarious moment for those of us on the other end of the leash. One night Bodie and I went outside to walk through the wet grass, one last chance for him to potty before bedtime. The other dogs were jealous and barked loudly behind the sun room windows. Bodie finally finished and walked up the steps onto the aging wooden porch. There he discovered his three Border Collie roomies almost nose to nose with him through the sliding glass door. I didn’t think anything of the experience. But the next morning, instead of running out to potty, Bodie ran over to the sliding glass door and there “it” was, another puppy. Bodie backed up, the other puppy backed up. Bodie moved to the right, the puppy moved with him. Finally Bodie barked at the cheeky pup looking at him through the sliding glass door. The other puppy, which looked exactly like him in size, didn’t bark back but it did open its mouth…just..like..him. Of course, I was laughing. 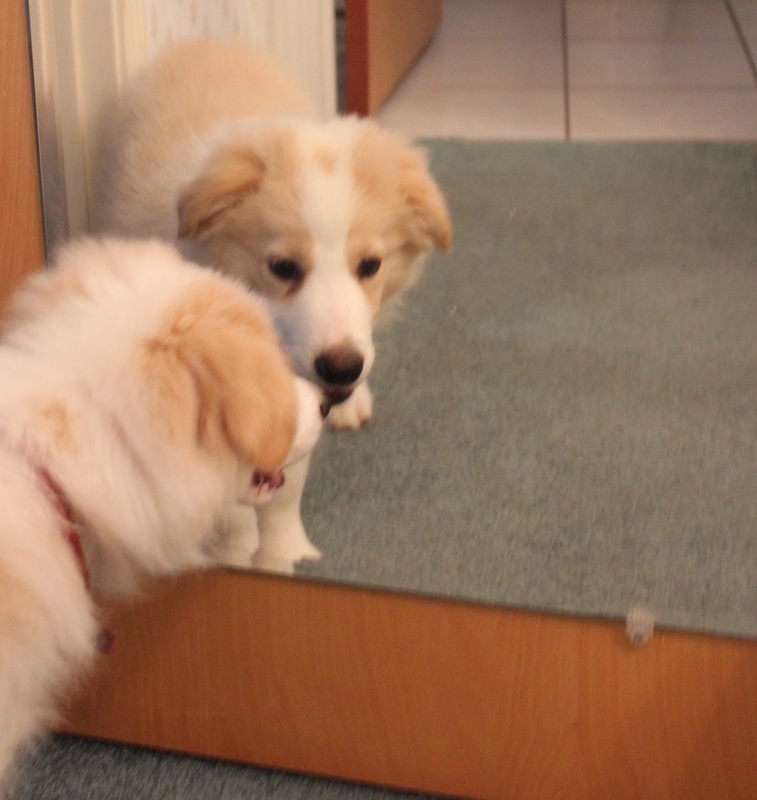 Bodie had discovered his reflected image, a magical concept that may confuse him for years to come. Several times now he immediately walks outside and over to the pup in the window. Sure enough that other pup is always there and it wants to play, you can tell. Why won’t it come out, I think Bodie asks? Hope springs eternal in the young minds of puppies. In my dog training building there are mirrors around the back wall, approximately 24” off the floor. As each of my other dogs has grown taller from small puppies to adults they reached a point where they suddenly were able to see above the twenty-four inch rim into the mirror. There again was the excited, beautiful or handsome, energetic image asking to come out and play with them. Instead of heeling along the back wall and watching me with perfect attention each young dog would spend time open-mouthed and excited about the dog in the mirror. Training would come to a halt. You can’t deny a young dog an opportunity to meet a new friend, a fun dog, a dog bursting to join in and play. But why, each puppy seems to ponder, why won’t it come out to play? Day after day, month after month, the dog in the mirror refuses to come out into the room. It’s all very confusing to young dogs, but to those of us who raise puppies it’s wonderful and funny and cute, a moment to sit back and watch how each new dog reacts to seeing itself reflected back. Eventually dogs mature and only glance now and then at the mirrors. I have to wonder though, even as adults, do dogs ever give up waiting, watching, wondering when their Doppelganger will jump out and join them? This entry was posted in Puppies and tagged Border Collies, dog obedience, Dog training, Obedience training, Puppies. Bookmark the permalink.